Joe’s diverse experience in physics and software programming quickly helped him excel at Mazak. Joe was part of the software department when he first came onboard, but his passion and interests made it a smooth transition to his new role of Applications Engineer. Tim Tapper, Applications Manager said, "Joe's prior experience in our Software group has proven to be a great compliment to the cutting and operational skills that he has developed in the Applications Department. In my opinion, the best operators start out as programmers because they have a good understanding of all aspects of laser processing." Read more to learn about Joe and his role at Mazak through this quick Q&A session. "Before joining Mazak, I studied physics at The Ohio State University and I was a Test Engineer at CNH. My role was testing tractor engine performance as well as other functions of the tractor." "I was originally brought into the software department when I first started at Mazak due to my background in physics and 3D modeling. I spent my first six months in software. But my personal background working with a CNC mill eventually led me to become an Applications Engineer." "At home, my family is very handy. We built our house and garage, and I personally have been working on cars for as long as I can remember. Largely due to my personal hobby and interests, I was naturally drawn towards working more hands-on with the laser machines at Mazak." "Now, I am an Applications Engineer and the ever-changing nature of this role makes it a neat opportunity. From training customers on how to operate Mazak’s laser machines, to running machine demonstrations, to customer support, I am constantly switching gears and doing different things." "One of the coolest projects I worked on was developing technology tables for one of the Mazak laser machines. This was an exciting project because the cutting parameters I developed are now being actively used by our customers on a regular basis." "First thing is to always help the customer out in a timely fashion. Second is to be respectable and strive to have a pleasant conversation so you can build a relationship and rapport with the customer. 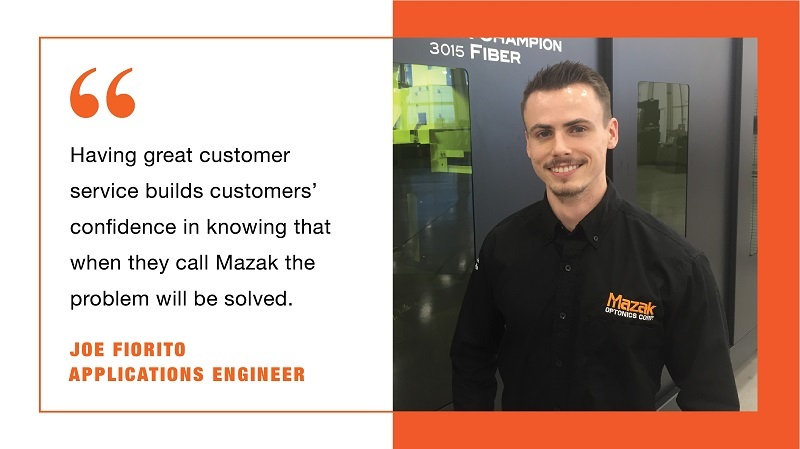 Lastly, having great customer service builds customers' confidence in knowing that when they call Mazak the problem will be solved." "Out of the office, I am into drag racing and working on my own cars. I currently race my car at a drag strip called Great Lakes Dragaway near Union Grove, Wisconsin. But I also plan on venturing out into circuit racing as well. I do all the work on my cars by myself or with my dad in our garage. 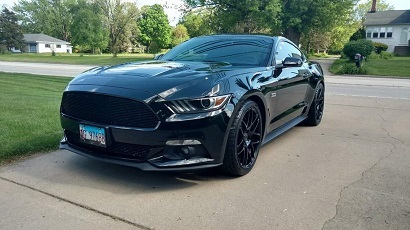 My personal car is a 2016 Mustang GT with 730 horsepower." "I recently finished up a three year long, frame-off, build of a 1956 Ford Customline restomod. This project involved a lot of fabrication since I custom made the grill, engraved the valve covers, laser cut a center console for the car, cut out and patched rusty panels, and made various brackets for engine components." "Strength training is also another hobby that I have. Having played all kinds of sports ranging from football to extreme sports like parkour and skiing, strength training is very important to me and I go to the gym every day before work. I’ve been into fitness for the past 6 years, but I started focusing on strength training about a year ago. I can now deadlift 405lbs, squat 325lbs, and bench-press 225lbs at 140lb bodyweight." "Hands down, my least favorite superhero is Superman. I dislike Superman not because he isn’t a good hero, but because he has every superpower there is. Since he has every superpower there is, he should be able to easily get out of every predicament he runs into, but he never seems to use them in the right place. I think it’s too cliché in how he is perfect in every single way but still can never use the right powers." "On the other hand, my favorite superhero is Spiderman because his powers are somewhat relatable (compared to flying anyway), and he can get very creative in how he uses his webs and his powers. His powers also seem like some of the most fun out of all the superheroes."